Self-care is an important process of the Hashimoto’s healing journey, and taking a little time for yourself to do little things you like is crucial. I encourage you to indulge in things that make you feel good and give you more energy and be mindful of things that make you feel worse and take away your energy. Now and then I like to have little “spa” days to take care of my adrenals. This past Friday I went to yoga, got a non-toxic facial, and spent a good hour soaking in Epsom Salts. I also spent some time browsing my favorite organic beauty products at Whole Foods! Little rituals like this make me feel rejuvenated and ready to take on the world. Most of my clients and readers find that being in the sunshine, naps, relaxing and being around loved ones are things that make them feel better. On the other hand, being cold, stressed out, being around negative people and eating inflammatory foods makes people feel worse. In some cases, it’s easy to pinpoint the things that are making us feel worse, in other cases, it may be more difficult to figure out what’s sabotaging our health. Our skin is a window to our internal health. It is the body’s largest elimination organ, and also a canvas where toxicities, nutrient deficiencies, food sensitivities, and hormonal imbalances can show up. Often, changes in the texture of skin and hair will be a first sign that something is off about our health. For me, I remember my hair being difficult to brush and my skin becoming drier before I was diagnosed with Hashimoto’s. Women with Hashimoto’s and autoimmune conditions are more likely to have dry, dull skin, rashes, hives, pre-menstrual acne and facial swelling, especially if their thyroid levels are not optimized, and they are not absorbing vitamins and nutrients correctly. Many women with Hashimoto’s feel like their skin is aging prematurely; this is often as a result of the dryness due to hypothyroidism/nutrient deficiencies while at the same time, some may see breakouts that they haven’t had since teenage years, due to hormonal imbalances/toxicities/food sensitivities. 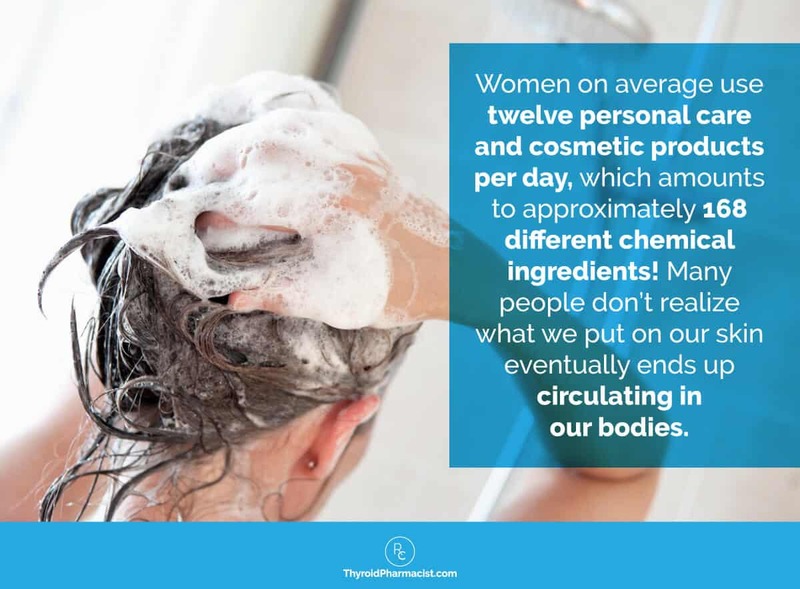 Unfortunately, men and women will often turn to using more potentially toxic personal care products, worsening their thyroid and hormonal health. If you’ve read my book, Hashimoto’s The Root Cause, you’ll know that chemicals found in our personal care products can act as endocrine disruptors. This means that they can offset the gentle balance of hormones, mimicking hormone activity and or blocking hormone activity in our bodies. Hormones work together in symphony, and when we have one hormonal imbalance, it’s likely that we have others. Thus an under-active thyroid can affect estrogen and vice versa. The consequences of these endocrine disruptors can result in skin breakouts, as well as some other scary things, including triggering autoimmune thyroid disease (especially by the chemical triclosan, which is found in our anti-bacterial soaps), causing weight gain, birth defects, and now, a recent study found that exposure to endocrine disruptors found in common personal care products and plastics (PCB’s, phthalates) can lead to early menopause. Women with greater exposure to these chemicals (as measured in 30,000+ women), went through menopause 2-4 years earlier compared to women with less exposure. 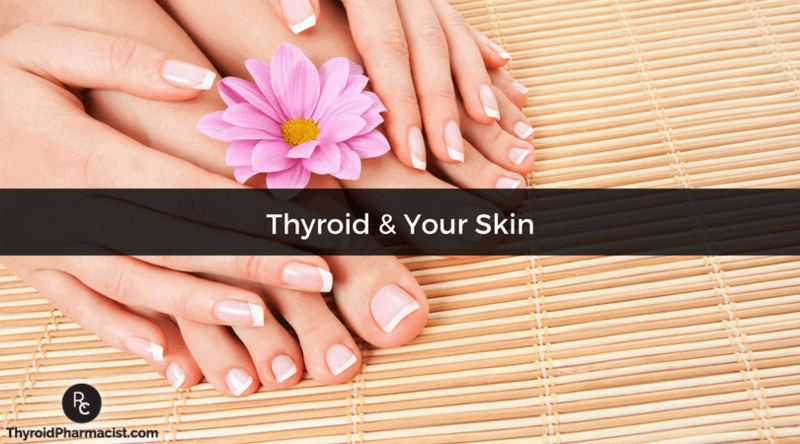 If your skin is dull and dry, be sure to check your thyroid hormone levels, TSH, Free T3/Free T4. If your thyroid is under-active, you may benefit from medications, a dose increase, or switching medications. Don’t use plastic to store or heat your food. You can use Ball mason jars (I prefer the wide-mouth ones) and/or glass storage containers instead. These do not contain toxins that can disrupt hormones. Do not use triclosan-containing antibacterial soaps, and check your toothpaste for triclosan as well. I recommend Periobiotic toothpaste that is free of triclosan and fluoride and also has probiotics for establishing a healthy mouth flora. Check out Environmental Working Group’s Skin Deep Database; that ranks personal care products based on safety and toxicity profiles. If you’re breaking out, consider food sensitivity testing or an Elimination diet to figure out which foods may be causing your breakouts (I was surprised that nuts were causing mine!). Hope that this information helps you on your journey! P.S. Be sure to subscribe to my email list to get a free book chapter, recipes, Thyroid Diet start guide and notifications about upcoming events. So may thing you have talked s bout I had surgery for I find your information so interesting.Thank you for your time. Frances- You are so very welcome! Most people will see a dramatic reduction in gut symptoms, brain symptoms, skin breakouts and pain by eliminating the foods they are sensitive to. Some will also see a significant reduction in thyroid antibodies! An additional subset of people, will actually be able to get their Hashimoto’s into complete remission just by getting off the foods they react to, normalizing their thyroid antibodies, and some even normalizing their thyroid function! Here are a couple of articles you may find helpful. Hi Dr Wentz. I have hashimoto and hypothyroidism and am trying to get pregnant. My cycles are all over the place with no regular periods. What can I do to get pregnant? I don’t even know what to ask my doctor! Lucy – thank you for following this page. Here is an article you might find helpful. Thanks DR. That article doesn’t address what thyroid does to periods and cycles. In your opinion what can I do or ask my dr to get my cycles in check. They are anywhere between 40-48 days normally. What do you do if you have had your t3 levels tested and you need t3 medication but your body can’t handle it. I’ve tried armour and adding cytomel to my synthroid but both times I experienced severe anxiety and depression. Ashly- There are quite a few options for thyroid medications. In my experience, what works for one person may not work for another. If your doctor will not prescribe the medication you are looking for, ask your local pharmacist for doctors in your area who prescribe the medication you are looking to try. Have you read these articles? Ashly, Get your ferritin, iron, D3 and B12 optimized (see optimal lab ranges on STTM) only then can your body tolerate T3. Apelila- Do you have Hashimoto’s or a thyroid condition? 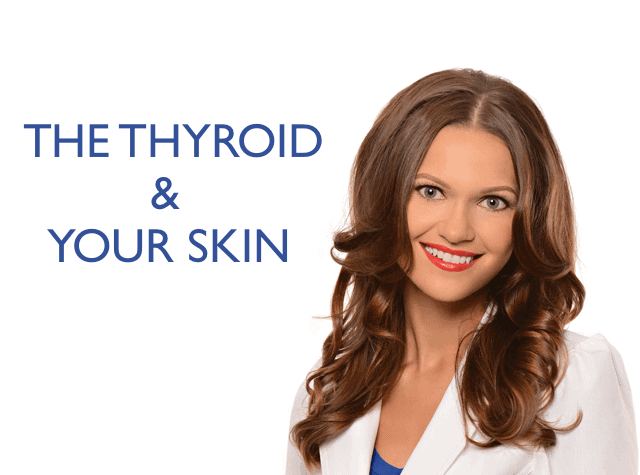 Have you ever heard of someone getting hives from thyroid hormone? At age 21, my thyroid was removed due to a benign adenoma – I had normal hormone levels, but the surgeon thought it was getting bigger. I took Armour for 10 years- then my gynecologist switched me to Synthroid which I also took for 10 years – then I awoke one morning to extreme hives which I endured for 8 months because no dr. thought the hormone could be the cause. It was – they switched me to Synthroid with no yellow #5, I still had them- they tried Armour again – The hives came back, but looked different in appearance. After 6 weeks off thyroid hormone and hives GONE, my doctor told me I would feel very tired, but would be ok. He sent me to an endocrinologist. My levels have tested normal range since 1991- but my hair is frizzy and my face is puffy. Any ideas? Have you heard of anyone being “allergic” to thyroid hormone? Dr. Laurence Wood, a thyroid specialist in Boston told me that he thinks as I became older, I needed less and was on a toxic dose. Vicki- Most thyroid conditions result from the immune system attacking the thyroid because the immune system is out of balance. Even when the thyroid is taken out surgically, is ‘dead’, or treated with radioactive iodine the autoimmunity still persists in most cases. Many people will have their thyroids removed, and will develop new autoimmune disorders such as Lupus, Rheumatoid arthritis, etc. The immune system just finds a different target. We need to re-balance the immune system to prevent this (sometimes the autoimmunity can be reversed as well). The gut determines your immune system. With the exception of discussing proper thyroid medication dosing, the majority of my website and my book focuses on balancing the immune system. The info I present is based on my own research and journey for overcoming my autoimmune thyroid condition. I started using Arbonne since it is free of parabens and harmful chemicals. My skin looks and feels healthier. Ruth- Most people will see a dramatic reduction in gut symptoms, brain symptoms, skin breakouts and pain by eliminating the foods they are sensitive to. Some will also see a significant reduction in thyroid antibodies! An additional subset of people, will actually be able to get their Hashimoto’s into complete remission just by getting off the foods they react to, normalizing their thyroid antibodies, and some even normalizing their thyroid function! Here are a couple of articles you may find helpful. I have only been on Armour for 5 days and already I feel a little more energetic. Im taking this as a positive and hopefully continue on an upward path. Thank you for your information ..now I will look into dry skin! Meg- Most thyroid conditions result from the immune system attacking the thyroid because the immune system is out of balance. Even when the thyroid is taken out surgically, is ‘dead’, or treated with radioactive iodine the autoimmunity still persists in most cases. Many people will have their thyroids removed, and will develop new autoimmune disorders such as Lupus, Rheumatoid arthritis, etc. The immune system just finds a different target. We need to re-balance the immune system to prevent this (sometimes the autoimmunity can be reversed as well). The gut determines your immune system. With the exception of discussing proper thyroid medication dosing, the majority of my website and my book focuses on balancing the immune system. The info I present is based on my own research and journey for overcoming my autoimmune thyroid condition. You might also want to check out “Know The Cause” with Doug Kaufman – It is a TV show & is online. I have had hypothyroidism since about 1994, gained weight & kept gaining. Got up to 217 (I’m 5’6″) & never could lose more than 5 lbs then just gained it back. But there was & is a complete change in what I eat & drink. Yet I plan to stay on this diet with some variations using the Phase 2 diet. Bets- When it comes to weight gain these are a couple of things to think about. I also have seborrhea dermatitis. I hear sugar is the culprit there. Do you have any thoughts to help me? AND OR – use Stevia (but nothing else in it – some are filled with bad stuff) – You can also grow your own. I use the Vanilla Stevia a lot. Bets- Most people will see a dramatic reduction in gut symptoms, brain symptoms, skin breakouts and pain by eliminating the foods they are sensitive to. Some will also see a significant reduction in thyroid antibodies! An additional subset of people, will actually be able to get their Hashimoto’s into complete remission just by getting off the foods they react to, normalizing their thyroid antibodies, and some even normalizing their thyroid function! Here are a couple of articles you may find helpful. Rose- I highly recommend that you work with a functional medicine clinician. It’s a whole medical specialty dedicated to finding and treating underlying causes and prevention of serious chronic disease rather than disease symptoms. Brenda- Graves and Hashimoto’s are both autoimmune conditions that affect the thyroid. They are thought to be closely related. Sometimes one turns into the other. The difference is the site of the antibody attack. In Hashimoto’s, the antibodies are found to thyroglobulin (in 80%) and thyroid peroxidase (TPO) enzyme (in 95% of people)-Hashimoto’s results in hypothyroidism and is usually treated with Synthroid and replacement hormone. Manzarm- You are so very welcome! Most people will see a dramatic reduction in gut symptoms, brain symptoms, skin breakouts and pain by eliminating the foods they are sensitive to. Some will also see a significant reduction in thyroid antibodies! An additional subset of people, will actually be able to get their Hashimoto’s into complete remission just by getting off the foods they react to, normalizing their thyroid antibodies, and some even normalizing their thyroid function! Here are a couple of articles you may find helpful. Are you recommending products that are contributing to my digestive and skin problems? I have been ordering products you recommend through PureEncapsulations (several hundreds of dollars) and I continue to have recurring digestive and skin problems – several products contain ascorbyl palmitate which is derived from corn dextrose. YIKES! All of the discussions on the various webinars and articles you reference identify corn as a real problem for many with Hashimotos and certainly with those with food intolerances with corn. Why would you recommend products with ascorbyl palmitate? Any alternative products without ascorbic palmitate? Also, those products at PureEncapsulations that contain d-alpha tocopherol (Vit E) – is this soy derived?? Greg- Thank you so much for sharing! Not everyone will need every single supplement! In fact, I believe that most nutrients should come from the diet, this is why I always list food sources for most of the nutrients, vitamins, minerals and probiotics that are depleted in Hashimoto’s in the book and on the blog. However, some may require/prefer supplements and the supplements on the website are a resource for those that do. I recommend getting tested for deficiencies to determine your need for a supplement as instructed in the book and blog. I also don’t recommend starting multiple supplements all at once. I recommend starting one at a time and then adding another a week or so later once it has been confirmed that the first supplement is not causing any harm. I do have your book. Very well written. I am male and I am 41 years old. I found about my hashimotos cause i asked to test for it cause my dad has it. I dont have any symptoms except higher TSH and some antibodies. Started with 90, went to 496 and now they stay around 30 TPO. My doctor says that TPOS below 30 they are not significant. My doctor did a stool test, food sensitivities, adrenal tests. No leaky gut, some stress issues and little food sensitivities to potato and eggs. (on scale from 1-10 around 3) He found EBV that was put under control with vitamin C and monolarium protocol. But nothing changed when it comes to my health. I always was feeling great and after i started treating hashimotos i was more stressful as i needed to be gluten free, etc. I cook everything myself. I am Polish as you are and i always wonder if Polish people and their Hashimotos is completely different then Americans. If i eat gluten i feel no difference at all. The only thing i can notice is dry skin and hair loss on my calves. I wonder why people with Hashimotos have dry skin? Is there a fix for it? Is it due to low t4 hormons? I dont understand why all the supplements and all that good diet dont affect my TSH at all. It always stays at higher range 3.5-7 depending on the time when tested. One day i had it 2.4 but then 2 weeks after 7. Is it possible that i am in some earlt stage of Hashimotos where dietary changes make no difference? I just dont get it? Should not my skin not be dry if i do everything not to aggravate the Hashimotos? Bart- Our skin is a window to our internal health. It is the body’s largest elimination organ, and also a canvas where toxicities, nutrient deficiencies, food sensitivities and hormonal imbalances can show up. Those with Hashimoto’s and autoimmune conditions are more likely to have dry, dull skin, rashes, hives, pre-menstrual acne and facial swelling, especially if their thyroid levels are not optimized and they are not absorbing vitamins and nutrients correctly. Keeping your thyroid levels balanced and getting the right oils in your diet such as from wild salmon, avocados, olives and coconuts should help. Topically, almond or coconut oil might help hydrate your skin naturally. Thank you for your comments. I do eat lots of avocados (3-4 a week) and salmon (1-2x a week). I never tried the almond oil. The truth is that no matter how hard i try i cannot tell if my body is reacting to any food. I feel good after eating any food i prepare. Eggs are fine, even wheat that i dont eat is ok.(if i try, last time i went on vacation to europe i had bread in France and i did not have any reaction, my antibodies were exactly same before and after eating gluten) Funny part is that the food sensitivities test says that i am allergic to pineapples which i barely eat, but when i eat it nothing happens so i dont know if you can even trusts these tests. What i dont understand is if i do all the things correctly in regards of diet, the EBV virus control, stress control why my TSH never stabilizes and wont go below 2-3. Should i ever worry about that number or rather go by how my body feels? Is it beneficial to people like me to take any thyroid medication? Do you need medication if you feel ok, but lets say have dry skin? Another problem is that my wive is exact replica of me. Before she cannot get pregnant we did some testing and she also have antibodies but feels great, has regular periods, is very lean and healthy. But has tsh is now 5.8 where it was 3.3 few months ago and 5 years ago it was 2.4. Conventional medicine wants to do some intrusive testing and xrays, but I dont want her to go through this nightmare as i am worried it will do more bad then good. I wonder if she must takes t4 medication in order to get pregnant? We have been trying for over a year and it does not click. All her blood results look great on paper. The only warning signs are her antibodies 222TPO and TSH higher. She started to supplement with selenium, D (has low levels in last test 25) and zinc (she fails the zinc liquid test) hoping it will drop the antibodies likeit did for me. Bart- I’m very hesitant in recommending iodine in Hashimoto’s. Although iodine serves as fuel for our thyroid and is very important in iodine deficiency hypothyroidism, Hashimoto’s is a different mechanism. It’s like pouring gas into an engine that’s on fire… that’s essentially what’s happening in Hashi’s, thyroid inflammation, and adding iodine to the mix before putting out the fire and fixing the engine may result in further damage to the thyroid. In those with a predisposition to autoimmunity, this has been documented time and time again, animal and human studies. I have spent 4 years researching this and have seen too many people suffering the consequences of adding iodine too soon. My approach is, let’s fix the engine first (usually a gut issue), and then add the fuel once we know that the engine is no longer on fire. Hope that you will check out my book. I have a whole chapter on the iodine controversy that references numerous studies as well as the work of Abraham and Brownstein. I would encourage you to reread the chapter, it starts on page 93. I would also highly recommend that you work with a functional medicine clinician. It’s a whole medical specialty dedicated to finding and treating underlying causes and prevention of serious chronic disease rather than disease symptoms. I do work with functional medicine doctor but to tell you the truth I don’t know what my goal should be. I came to this doctor cause I noticed my antibodies were existent. I did. It have any symptoms except cold feet and hands but this was not that bad as it was only happening when it was cold. So I asked the doctor to help me find a root cause of my hashimotos and put it in remission. Before I started to see him my antibodies were 90 tpo. Then I was on autoimmune diet for 3 months and they went up to 490. Something I could not ever understand. Then I started to see the doctor and he discovered ebv. With selenium,zinc, vit d and vit c and minolarium protocol ebv went away. It my tsh was always higher around 6-7. I could never understand why if ebv was removed, I was gluten free and for some time no eggs and diary but tsh still Did not like to go down. I did extra medidation every night but it did Not change anything. It was only this year when i saw my tsh go down just before going on vacation. I was curious and i checked if ebv was deactivated and this is when I noticed it reactivated. I tested it myself to prove to my doctor that gluten was not a cause and something else got the ebv reactivated. After that I went to Europe and I was eating bread like crazy. I retested myself after 1 month after coming back from the trip and nothing changed except ebv being active. So it is crazy difficult to figure out what is wrong especially when there is not much symptoms affecting my life dramatically like I see in others. Yes I got your book and I will reread it. I also read the brownstein book and it was very interesting but my doctor thinks like you that iodine is bad for me. Any input that you could give me would be greatly appreciated. Thanks! Marlo – please, understand that due to liability issues, I am unable to answer specific medical questions. I had my thyroid removed, due to thyroid cancer. My acne is severe and in my chin area. It’s the big, red, puffy kind, some are really large white heads, too. It makes me really sad and to the point of tears. It is also beginning to get painful. I am 33 years old. Michelle – thank you for following this page. Most thyroid conditions result from the immune system attacking the thyroid because the immune system is out of balance. Even when the thyroid is taken out surgically, is ‘dead’, or treated with radioactive iodine the autoimmunity still persists in most cases. Many people will have their thyroids removed, and will develop new autoimmune disorders such as Lupus, Rheumatoid arthritis, etc. The immune system just finds a different target. We need to re-balance the immune system to prevent this (sometimes the autoimmunity can be reversed as well). The gut determines your immune system. With the exception of discussing proper thyroid medication dosing, the majority of my website and my book focuses on balancing the immune system. The info I present is based on my own research and journey for overcoming my autoimmune thyroid condition. Why is it that only women have these skin conditions and men don’t? I am a man with Hashimotos and with similar skin issues. I have been suffering from extremely dry skin. When I was diagnised with Hashimotos in May 2017, I was put on levothyroxin, it made my hair fall out. I then went to a functional medical doctor and was put on WP Thyroid, my hair continued to fall out. I had a new doctor this past December tell me I could go off my meds and supplement with coconut oil, as she thought my hair loss was mainly a side effect of the WP thyroid medication not my thyroid levels. Again the hair loss continued and it wasn’t until another provider started treating me for MTFHR gene mutation via supplementation ( my body’s inability to process and absorb vitamin B) that I noticed my hair really took a turn for the better. However, everytime I wash it I notice a lot of hair fall. I use organic coconut shampoo and conditioner twice a week. It has a short list of organic paraben and sulfate free ingredients. I’ve tried hair conditioning masks ex; egg wash, Olive oil, honey, potato, neem oil, essential oil(s), aloe Vera and castor oil masks, ALL of these make me loose even more hair like I mean clumps! I don’t know why but these dry my scalp out even more. I’ve lost about half the hair I had since my diagnosis and can’t afford to keep guessing what might work. What shampoo can I use that isn’t going to exacerbate my hair loss when I wash it? In addition the rest of my skin is always dry my face and hands in particular, I feel like I look older then 33. I’m on vitimine and mineral suppliments including primrose oil, but still having this problem. I’m desperate, do you have any suggestions? Thank you so much! Meridith – thank you for following this page. Sometimes, when your TSH is on the outskirts of the normal range, you can continue to lose hair, and your hair may lack luster and shine. If your hair tangles easily, this is a sign that you may not be getting enough thyroid hormone. Talk to your doctor. You should see a change within 4-6 weeks. Hi Dr. Wentz, I was wondering if you ever heard of a problem like mine. The skin on my arms became VERY strangely dry, wrinkly and saggy a year ago and are getting progessively worse. It is very pronounced with sagging from the inner elbow to the forearm. When I lie down and turn my arm sideways, they look like a 90 year old wrinkled and loose skin. I am freaking out! I am 54 and going through menopause. My blood work shows a TSH of 4.7 and I believe it’s been undetected and high for a long time. My estradiol is too high and my progesterone doesn’t exist. I’m seeing an endo later this month and might go to a functional dr. if I don’t get help. I asked my primary to put me on levothyroxine just to tide me over until I see the endo and I am taking .25 mcg four times a week. I understand that you can’t diagnose me online, and I need more thorough thyroid tests, etc as well. In the interim I am just wondering if such a skin problem as I’m seeing with wrinkled loose skin on my arms could be common to Hashimoto’s or non- Hashi’s hypothyroidism? I am going to ask to be tested for Hashimoto’s as well. I’ve also had hair loss for three years with fine and thin regrowth since then. However my skin is now scaring me more. Thanks very much! thank you very much! I am a strong believer in digging for the root cause of problems. I gave up all gluten, added sugar, the very few packaged foods I ate, table sugar, etc. etc. and I am equipped with the knowledge of all the right tests to order from great articles like yours. I think thryoid is directly related to my hair and extremely dry skin on my arms. I am still uncertain about why my arms sags and wrinkle like a much older person, as if aging has accelerated, but next I will dig into cortisol and insulin resistance testing while working on balancing my estrogen to progesterone and testosterone levels. I hope that skin can snap back as well as hair but I am not sure it’s that easy. Before taking drastic measures like surgical options I will test everything and exhaust all possible treatment methods while continuing to follow an optimal diet and exercise daily. By the way, going gluten free, while not yet changing the fat collection in my lower body and upper arms, has brought the scale numbers down effortlessly by several pounds, even if I sit and binge on nuts every so often! Good fats do not cause weight gain which I found a shock as I was always brought up to think of fat as the enemy! If I do find I have Hashimoto’s then I’ll certainly add your Hashimoto’s protocol to my must read list. Thanks for all you do! I just started taking NDT capsules for my Hashimoto and my skin broke out bad on my chin and jaw line and I’m wondering if this could be the side effect of the pills. Ana – thank you for reaching out. I wish I could give you more direct advice but, each person will react differently. I would advise you to ask your trusted clinician who’s care you are under. There are quite a few options for thyroid medications. In my experience, what works for one person may not work for another. If your doctor will not prescribe the medication which you are looking for, ask your local pharmacist for doctors in your area who prescribe the medication you are looking to try. Have you read these articles? I had a TT for cancer in Nov 2017. Right now I am on NP. For the past 6ish months my scalp, back of my neck and top 1/3 of my back is DRIVING my insane! I am on the Keto diet and have lost 70 lbs but nothing since my TT. I do have Hashi and not sure what to do now. Janet – thank you for for reaching out and sharing your journey. There are quite a few options for thyroid medications. In my experience, what works for one person may not work for another. Did you know that most thyroid conditions result from the immune system attacking the thyroid because the immune system is out of balance? Even when the thyroid is taken out surgically or treated with radioactive iodine the autoimmunity still persists in most cases. Many people will have their thyroids removed, and will develop new autoimmune disorders such as Lupus, Rheumatoid arthritis, etc. The immune system just finds a different target. I was just wondering will the signs of premature aging improve or be reversed once you have found your root cause and are on the appropriate treatment? I am in my late 20s and I have some forehead wrinkles from my very dry skin. I’ve addressed most of my root causes and am on np thyroid. I’ve noticed a great improvement in my dryness and breakouts but unsure if the wrinkles will improve. Kayla – thank you for reaching out. It is hard to say because everyone is different. Our skin is a window to our internal health. It is the body’s largest elimination organ, and also a canvas where toxicities, nutrient deficiencies, food sensitivities and hormonal imbalances can show up. Women with Hashimoto’s and autoimmune conditions are more likely to have dry, dull skin, rashes, hives, pre-menstrual acne and facial swelling, especially if their thyroid levels are not optimized and they are not absorbing vitamins and nutrients correctly. Here are some articles I hope you find helpful.